Congratulations on your (your child’s) success in MBA/MMS CET or MHT CET or other exams. Vidyarthimitra.org, for the first time in the history of Maharashtra, designed a student-friendly software which helps you get best Colleges/Branches in accordance with your marks. We guide you to fill the option forms of various MBA / BE-B. Tech/ B. Pharm/ MBBS etc, Colleges/Branches at a few clicks. The choices will be based on previous year’s cut-offs, your present CET Marks, SML, other relevant parameters and your personal choices. You will be guided step by step on how to use this software for filling your options and get admission to the best University/ College. This software is for all the 15 courses under DTE Maharashtra. All this at a nominal fee. Please inform your family, friends and contacts about this service. We offer personal counselling in Mumbai / Pune for DTE, FYJC Admissions and other Professional Courses. We also provide expert guidance on higher educational opportunities in India and Abroad. Outstation students may avail this service on Skype or Phone, with prior appointment. All the filled in details are fead into the algorithms and calculation of prediction takes place. 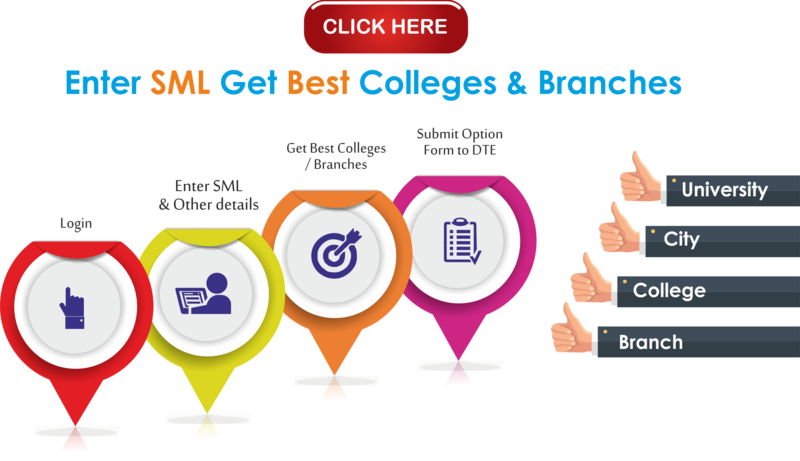 Find out the best colleges/branches based on your details and past admission trends.